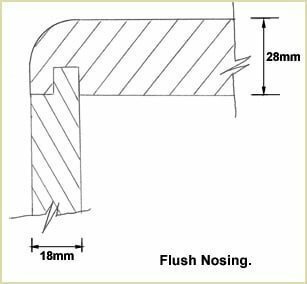 From this, building inspectors are now asking for flush nosings in buildings containing flats, (i.e. public stairs where there are no lifts). The objective should be to make reasonable provision for disabled people to visit occupants who live on any storey. 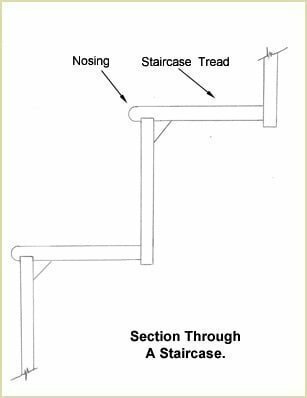 Flush nosings should be used on public stairs when a passenger lift is not provided.,This is to eliminate the trip hazard found with standard nosings that overhang the risers. Pear Stairs have been making more of these this year. 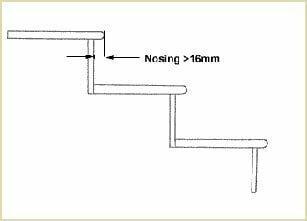 In a private dwelling, regualtions require a nosing overlap of at least 16mm. Without a 16mm overhang it would make the overall going on the staircase very long to accomodate at least a 220mm tread. Remember, you can always phone to receive answers to any questions. Phone Pear Stairs on 01938 553311. We are a very friendly, helpful company.